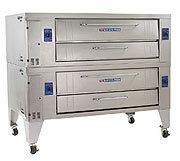 Bakers Pride Y-602 Double Deck Natural Gas Commercial Pizza Oven - BAKERS PRIDE Super Deck Y-Series gas Deck Ovens are designed for high volume pizza and all-purpose operations. Ovens may be stacked two high. Oven exteriors are all heavy gauge, type 403 stainless steel and are fully insulated up to 5" (127mm) thick for cooler outer temperatures and consistent interior temperatures. Interior oven frame is constructed of 1/4" (6mm) heavy-duty angle iron frame, completely welded to form a single, unitized section. The oven body and lining are then welded to the framework. Oven interiors are manufactured of high-heat resistant 16-gauge aluminized steel. Doors are fully insulated, spring balanced with tubular steel handles and will remain open or closed until moved. All models feature independent, operator-controlled top & bottom heat control dampers and micro slides for perfectly balanced results. Y Series features a 300-650 F (149-343C) thermostat, 8" (203mm) interior deck height with decks (steel decks optional) and are supported by a 1/4"(6mm) angle iron frame. Combination gas control incorporates a manual gas valve, pilot safety and pressure regulator. Easily removable, slide-out, heavy duty flame diverters distribute the burner flame uniformly in the burner chamber. A 3/4" (19mm) NPT gas connection is located on the left side and left rear of oven - operator/installer may choose. Heavy-duty, 7-gauge hot rolled steel legs are standard and finished with durable Bakertone. 2 Year limited part and labor warranty standard.